Every parent’s number one goal is to keep their baby safe! So, of course, many of you devoted parents of newborns were quite upset this week due to an overwhelming number of scary headlines that followed the publication of a new study “Swaddling and the Risk of Sudden Infant Death Syndrome: A Meta-analysis”. Pediatrics (May 2016). 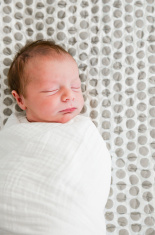 “Swaddling babies may increase risk of SIDS,” the headlines blared. Some readers latched on and panicked. But the analysis emphasizes a more nuanced conclusion that supports what many parents and pediatricians already know about safe sleep for newborns. Put another way, stick to current advice not to place infants to sleep on their stomachs or sides, and stop swaddling as your baby grows, probably around the time he or she shows signs of rolling or begins to break out of this fabric cocoon. Remember if you still have concerns or want further guidance call your baby’s health care provider, take a Newborn Care Class, and take an infant and child CPR class.